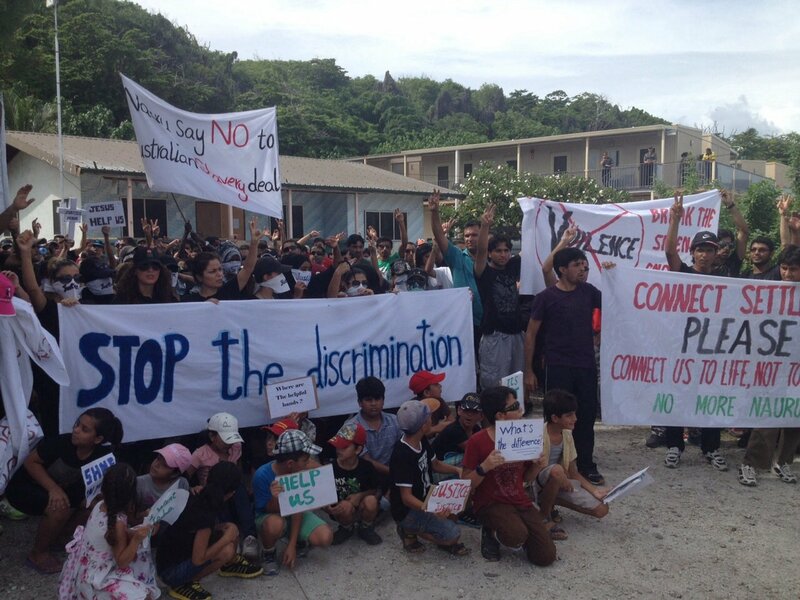 Around 300 refugees on Nauru staged a protest yesterday, Friday afternoon, 27 February. The peaceful protest assembled at Beach House, the accommodation for many of the Australian personnel employed in the detention centre. However, when the rally attempted to march around the island, Nauruan police (supported by Transfield riot squad) blocked the road and attacked a number of the protesters to prevent the march proceeding. Five people were treated after being punched in the face or pushed to the ground by police – but no-one was hospitalised. A Pakistani man recording the protest was also viciously punched. The rally comes at the end of the first week of a campaign of non-cooperation that has seen boycotts of schools, and English classes, and refugees quitting their jobs. The protesters carried banners and placards highlighting the discrimination that has seen around 1300 asylum seekers dumped on Nauru with no avenue for secure resettlement. The campaign of non-cooperation will continue. Photos and videos are available here. There are Nauruan refugees also willing to be interviewed. Contact Ian Rintoul 0417 275 713 for more information.